In an interview, Frank MacLear said the boat was designed to be sailed anywhere in the world. She is a small boat at 34.5 feet overall, but a worthy passage maker. Beyond her seakindly and lovely sailing characteristics, she is a beauty to behold. She was designed by very capable naval architects and built by a company with impeccable credentials. Her hull and deck are solid and her interior thoughtfully laid out. As a centerboarder, she is capable of safely traversing shoal waters, gunk holing remote regions, enjoying anchorages impossible for boats of deeper drafts, and searching far up stream for more secure harbors and refuge from approaching storms. At sea she is stable and comfortable, but as a centerboarder, the capable sailor will know to reduce sail earlier than on deeper keeled boats. The Allied Seabreeze was designed by MacLear & Harris in 1962. A total of 135 of these magnificant boats were built between 1963 and 1972. Of these, we know of only two boats that no longer exist. One is known to have been destroyed on a reef in the South Pacific and the other was scraped after surviving a fire and was considered to be too much of a project to restore. The remainder of these boats, many belonging to members of the Association, are actively sailed or are being refurbished or restored for future sailing. 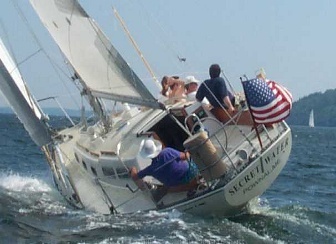 Welcome to the website for the Allied Seabreeze Owner's Association. The purpose of this website is to provide current and former owners of the Seabreeze 35 a place to share information and learn more about their boats and meet other owners. We hope you enjoy the website and check back frequently as we have much more to add in the future. Please send us your ideas. If you're already on Facebook, we hope you will join our new group. You can search for it at "Allied Seabreeze 35" and send us a request to join. This will not take the place of this website. We are trying new ideas and this is another way to reach out to our group.